At the Farm: See our new picnic tables! Here at the Farm, we recently celebrated the arrival of our new picnic tables, designed and built by Ted Esselstyn, who was so nice to share some photos of the table-making process with us. The wood for the tables is local…very local: two red oak trees across the street from the Farm, which were sick and endangering the building they stood next to, were harvested for the new picnic tables. Ted milled the trees with the YSFP’s help, and created beautiful and functional furniture out of what would have just become another pile of mulch. Check out the slideshow from tree to table — it’s a great reminder of how great it can be when we go local not just for food, but for other services as well. Stories from the Farm: How will we eat? Last night, I made a salad out of Lacinato kale, Chioggia beets, Hakurei turnips, kohlrabi, and zucchini. Two months ago, I could have identified exactly one of these vegetables (zucchini), and the only salads I’d ever made involved tearing some iceberg lettuce, maybe (just maybe) cutting up a tomato, and pouring on a bottled dressing. The questions of what we eat and how we eat it have been nagging at me for a while now, but until this internship my answers were mostly dependent on the microwave and a few select aisles of the supermarket. Kohlrabi rarely shows up in Whole Foods, much less the local Stop & Shop, which makes me doubt whether I would have ever discovered it on my own. The supermarket seems to function as a closed loop: its patrons might easily be convinced to visit a farmers’ market if someone showed them a Kohlrabi, let them taste and hold it and made them curious enough to seek one out, but the only produce you know when you shop at a supermarket is supermarket produce. It took me six weeks of actual farm work, of learning enough about a vegetable to nurse it to harvest and sell it at market, to get me to last night’s salad. But now that I’m here, that supermarket produce is going to be a much harder sell. How will we eat? This question often loses out to its competitor, “what will we eat?”. After all, ‘what’ seems like the most loaded term — it implies a whole range of possible foods that one could ingest, and suggests the danger that the modern consumer faces when trying to sate his or her appetite. Ask this question of a food-lover and they will thank you profusely before starting out on their personal rant about “good food”. But now that I think about it, “what” delimits the issue to a simple matter of substitution; for example, will we eat processed meats that are injected with antibiotics, or will we buy from the local cattle rancher who lets his steer out to pasture? A question of preference and economics. However, there is more at stake here than a simple change in consumer preference. 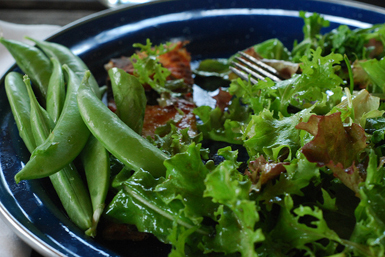 “How” encapsulates everything that goes into eating and living well. “How” allows us to consider the pleasure of cooking one’s own food, and the passive stagnation of waiting in line to receive food being cooked without care, for a cheap price. “How” allows to think about the speed with which we expect to be fed, and after-affects of food after we swallow it down into our stomachs. Let’s face it here, eating is one of the number one activities we humans engage in, and considering how we go about the act maybe a fruitful contemplation. Just as how there is a right way to harvest wash lettuce on the way to market, there is a right way to feed oneself and one’s loved ones every day. How, then, shall we eat? If the executives at Monsanto have their way there will come a day, not terribly far in the future, when their ultimate vision is fulfilled. Their business plan complete, and the world saved from all unsavory plant species, they will sit back and cross their pinstriped arms. They’ll look at each other and know that because of their hard work their sons and daughters will only ever have to eat one type of soybean. That because of them their apples will only be fire-engine red and perfectly shaped. Their corn will be fat and tall and as yellow as the butter no doubt destined for its surface. Their melons a perfect sphere grown on vines progammed to arrange themselves in parallel lines. Their potatoes precisely porous enough to absorb as much french-fry oil as possible. Their tomatoes as round as a hamburger would want. That’s what they will get to eat. “How will we eat?” implies another important question: “How will we grow?” My answer, after reading Bill Duesing’s 1995 book review of Ishmael and two competing reports on the future of agriculture, involves not just abolition of the fashionably vilified corn subsidies or GMO patent laws, but also comprehensive land reform. Duesing quotes Cary Fowler and Pat Mooney, the co-authors of one of the two reports: “The green revolution answered the problem of hunger and rural unrest with increased production, not with land reform or employment projects; essentially it offered a technological solution to a social and political problem.” What is needed is the redistribution of 10,000- and 100,000-acre farms to many small, organic growers, each managing no more than 20 or 40 acres apiece. 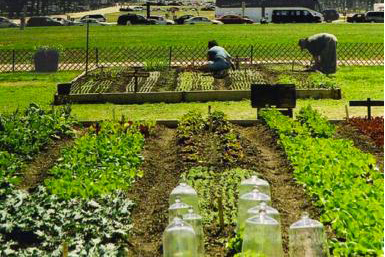 Whether through eminent domain or the more gradual route of subsidies for small organic farmers (especially those who replace synthetic fertilizers and pesticides/herbicides with more intense labor—thus employing many more people), we need to solve the sociopolitical problem that Malcolm X saw as “the root of every revolution.” Only then will small farmers have the power necessary to properly implement crop diversity, rotation, and care. I spent last summer as an intern at a major multinational corporation. Turns out I’m pretty good at making spreadsheets, reading legislation and performing other tasks that help companies improve their bottom line. At the end of my time there I was rewarded with a cash bonus. Admittedly, that felt pretty cool. Now I’m working on the Yale Farm. Here, though, there are no cash bonuses, and our goal isn’t to make money zip around faster than the other guys. We have different things in mind. Today at check-in, for example, Daniel remarked that I make a mean soil block and said that I should show others my technique. The little squares of earth might evoke an Excel workbook, but the similarities end there. Instead, they are filled with seeds which will hopefully germinate and eventually produce food. As I thought about his remark later in the day, I realized that it meant more than any cash bonus possibly could. I don’t know what happened to my database entries or memos at my old job. I do know, however, that my soil blocks- fashioned tightly and crafted with care- will be a nice home for a baby plant one day soon. That’s a bottom line I can get behind. The best part about being a farm intern so far is watching things grow; seeing your first seedlings poke through the soil can make you feel somewhat like a proud first-time parent. It never ceases to amaze me how one tiny, unassuming seed can become a head of lettuce or a tomato plant that can reach from the ground up to the very top of the hoop house (and would probably keep on going if there was room). Even more amazing, though, is the fact that this process requires no magic trick, no special touch, and that anyone – even me – can set the wheels in motion (well, more or less anyway) with a little training. It became clear within minutes of stepping off the bus at Massaro Farm for our first field trip that Steve, the farm’s manager, is a born teacher. He is also a born farmer. Disarmingly friendly and reassuringly collected, Steve succeeded in breaking down Massaro’s initially overwhelming sixty acres of farmland for us into the manageable units through which he approached the land himself (it also helped that only 4 of these acres were being planted this season). One thing that struck me as we set to work hoeing weeds in Massaro’s massive forty-inch beds was that despite the obvious differences in scale between Massaro and the Yale Farm, most of the obstacles faced and the techniques used to solve them were easily transferrable. Steve still has to churn up his soil before replanting, but the size of his operation demands that he use a tractor instead of a broadfork. 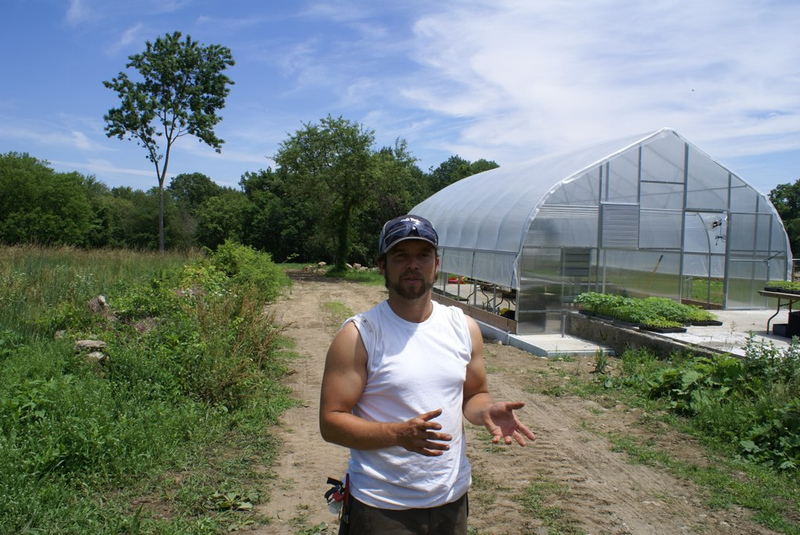 Steve, like Daniel, had a well thought-out crop plan and was ready with a justification for each vegetable’s placement, and Steve intends to implement the same kind of crop rotation we rely on at the Yale Farm to keep his soil healthy and catch pests off guard. It was comforting to learn that though our single acre at the Yale Farm can often feel like too much to keep track of, the skills we’ve picked up in the last few weeks would prove just as useful on a farm two, four, or even sixty times our size. I confess: I am obsessed with food to a ridiculous degree. I spend my free time pouring through cookbooks and food blogs to find new dishes to try. One point on a longs list of things I love about the farm is that it is a constant source of inspiration for new recipes and menu planning. For example, while planting those tomatoes and cucumbers, all I could think was GAZPACHO. Also, after harvesting the fava beans I contemplated making an awesome Fabada Asturiana. I love challenging myself to plan my dinner around what is available on the farm each day. So, let’s say I come into work and learn we have bolting bok choy. It’s no longer marketable, but it is still not only edible, but delicious. I decide to take some home for dinner. And here is where the fun begins. 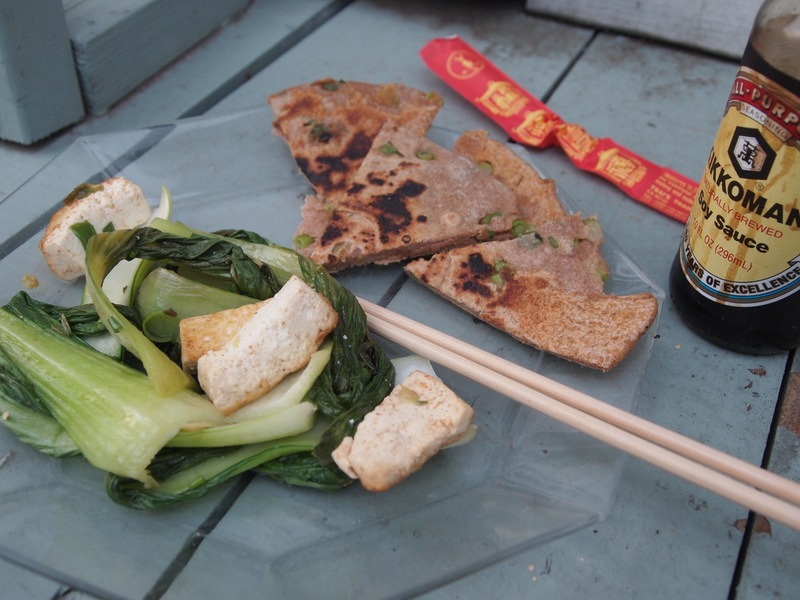 As I work through the garden, part of me is hunting for the best ingredients to complement the bok choy. 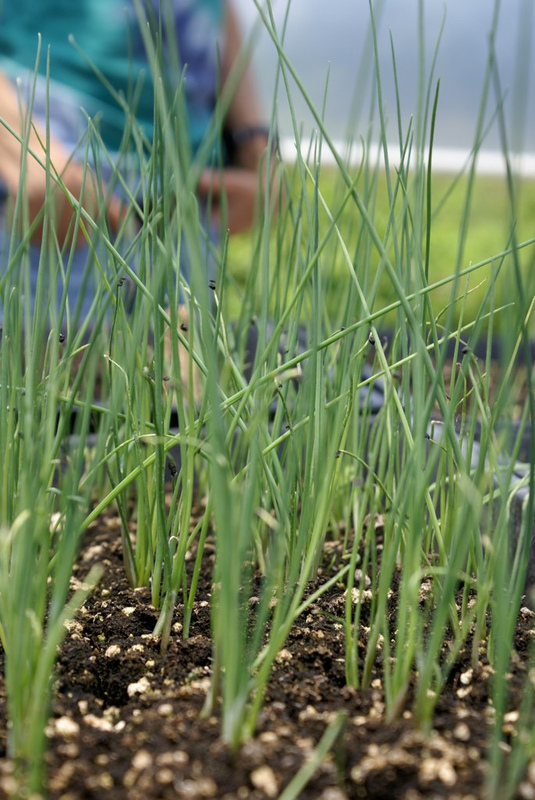 While cultivating the Alliums, I see the garlic scapes are mature. They will go perfectly. As I’m prepping a bed by the snap peas, I pick one off the vine. It’s quite possibly the most delicious pea I have ever tasted, and it must be part of my dinner. And as I’m on my way to transplant lettuce… Oh, hello there, cilantro. You’re coming home with me. This is my favorite way to cook. The produce I use is in its freshest, sweetest, most flavorful state. It’s a little embarrassing how excited I get about these vegetables. They are so EXCELLENT, and I’m pumped to cook with them all. 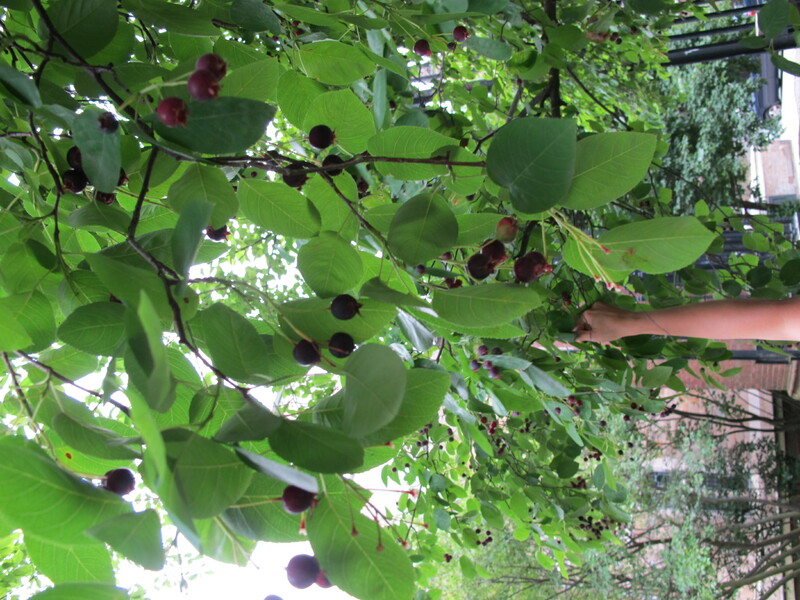 This week, Farm Manager and Educator Daniel Macphee teaches us about New England’s summer gift of the serviceberry, where to find it on the Yale campus, and how best to enjoy it. Coming up in the next weeks, look out for posts from our six new summer interns! For both joy and duty, our urban acre is thick with tasty and culturally important heirloom vegetables. Traditional Italian chicories grow alongside Austrian lettuces, Japanese radishes, Mexican herbs, and many unique crop varieties developed by generations of American agrarians before us–each pepper, eggplant, melon, and tomato with a story as rich and particular as its flavor. Though, sometimes our (understandable) infatuation with exotic crops and cultures leads us to forget the hardscrabble things that manage to grow and provide bounty in New England naturally… like the serviceberry. Unlike a tomato that we might coax early in a greenhouse in order to stretch the bounds of our climate, foraged foods anchor us more concretely to place and season—they are ready when they are ready, and we too, as part of the cycle, must be ready. Serviceberries are a delicious native tree fruit of the rose family (like apples and pears). 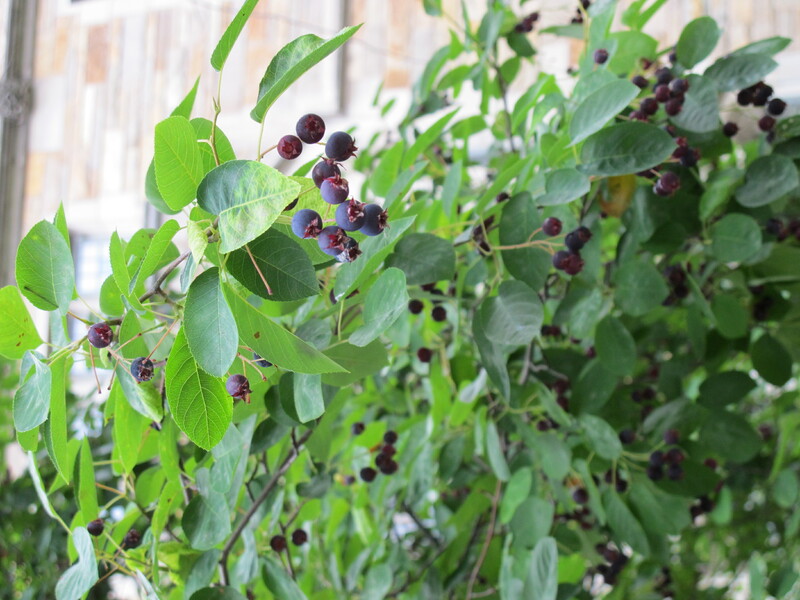 Their fragrant white flowers burst open around the time that shad run in New England streams, and their plump purplish-red berries ripen in late June, hence their other common names ‘shadblow’ and ‘juneberry.’ Birds and squirrels love the sweet blueberry-like fruits with nutty seeds, but, fortunately, Yale’s urban landscaping is so full of these trees there is plenty of fruit for people too. After checking with Grounds Maintenance to make sure the trees are not sprayed, the farm crew set off Friday afternoon to experience the pleasures (and quizzical stares) of urban foraging. Over the course of an hour I talked to at least 15 curious passersby and still managed to bag more than 8 cups of fruit along York Street. The berries are delicious fresh, but can also be frozen or dried for later use. Try them in pies, muffins, scones, or by the handful on yogurt or ice cream. Serviceberries are also a great fruit to experiment with in jams because they thicken up nicely with their own naturally occurring pectin. 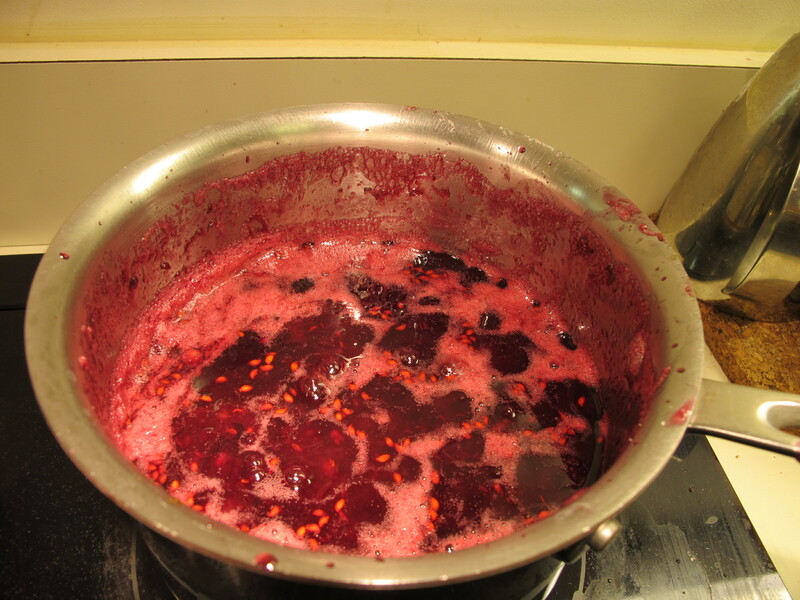 This time I made two very simple jams to preserve the bounty: serviceberry-rhubarb and serviceberry-orange/lemon. To make your own: mash and simmer roughly equal parts of serviceberry and rhubarb, and a little less sugar, until it gets thick. Or: grate the rind of any citrus of your choice (we had half a lemon and an orange), grind the remaining pulp and add it to your mashed serviceberries, simmer until it thickens. You can add some spices if you like (try cinnamon, clove, cardamom, ginger, etc…) or just let the fruits speak for themselves. So, next time you’re waiting for the shuttle on York Street, reach up and enjoy a tasty snack. Or, better yet, miss the bus and gather enough to take home and share. If you’ve ever stepped on the Yale Farm, then you’ve met Daniel. He works closely with our student farm manager and our volunteers alike, making sure the Farm is beautiful and healthy. Today, Daniel welcomes our six summer farm interns. As spring slips leisurely into summer, everything accelerates in the garden. Our perennial beds are exploding with vibrant blooms and busy insects, warm-season weeds are breaking dormancy to harass our early carrots and salad greens, and, most importantly, our new crop of summer interns embark today upon a season of labor and learning on the Yale Farm. With their arrival, we release the clutch and take off into the summer growing season. From day one, they will be learning by doing — clearing the hoophouses of early spring greens to plant tomatoes and grain, hilling potatoes, harvesting for market, propagating seedlings, and defending our urban acre from the weeds that never seem to rest. In addition to farm work, they will have a weekly seminar, field trips to local farms, and cooking lessons. We will be taking a break from volunteer workdays while the new interns get settled in, but starting June 17th, we encourage you all to join us for our summer drop-in volunteer days anytime between 9:00 am–4:00 pm on Thursdays and Fridays. If weekdays don’t work for your schedule — please come visit us at the Wooster Square Farmers’ Market on Saturdays 9:00 am–1:00 pm, or join us Sunday, June 20, for our next Community Farm Day. It was just two weeks ago that we finally celebrated the Third Annual Jack Hitt Annual Last Day of Classes Pig Roast at the Yale Farm — it feels like much longer! In celebration of a year of learning about food as a community, over 500 visitors came to the farm to help shape plant beds for the summer season, to hear some great music, and not least, to eat delicious sustainable treats! We served cornbread, collard greens, coleslaw, black-eyed peas, and pecan pie in addition to pulled pork, all cooked by YSFP student interns and their friends. In case you missed out, please click below to view a slideshow of the day’s events! And if you ever wanted to know what it’s like to cook 60 pounds of beans and 180 pounds of pork, here’s a breakdown of the preparations for the Pig Roast from Margaret and I — it was quite an undertaking! Though the sustainable food movement often encourages folks to eat less meat, when we do indulge, we make sure to purchase from a local farmer we believe in and eat the whole animal. In that light, our annual Pig Roast is as much about coming together to celebrate the end of classes as it is to remind us of the benefits of snout-to-tail eating. We maintained that 220°F temperature all night, adding logs to the pizza oven to incinerate into wood coals before dropping them into the smoker. Steamy aluminum pans of water in the bottom of the smoker kept the meat from drying out. It was a long and cold night – adding wood to the smoker would drop its temperature, but we had to open it to add in the wood that would maintain its temperature! Taking turns, we napped while the other watched the pigs. Two friends visited in the wee hours of the night. Eventually the sun rose, and ever so kindly, Jack Hitt brought us much-needed coffee at 6:00 am. The pigs had been smoking for 10 hours at this point! Around 10:00 am or so the meat reached the desired “done” temperature of about 165°F, and all we had to do was keep it warm and smoky until we pulled the pork. Other food preparations kept us busy, but finally at about 2:30 pm – over 16 hours after it was started – three of us hauled the heavier pig from the smoker to a table, where we preceded to pull every last bit of meat from every bone. I couldn’t help but nibble as I pulled the pork. It was incredible. Aside from knowing that the meat was responsibly and ethically raised, and aside from all those hours of hard work, it was still the best meat I’d ever tasted. Real tears came to my eyes when I got a big bite of the amazing fatty meat from the cheek of the animal – it was that tender and flavorful. It took three of us almost two hours to transform two pigs into a pile of bones and a crowd of happy eaters. The savory, crispy skin was an unexpected favorite with our guests, and every last bite of our delicious pulled pork was eaten. In the days after the Pig Roast, the bones were used to make delicious stocks and stews, proving that you can (and should!) use the resources of whole animal. The night I stayed up with the pigs will always be special to me – but next year, can we fit three pigs into a smoker? It’s 6:00 pm, I have 21 hours until the official start of the Pig Roast, and I am the black-eyed pea queen. Here’s my to-do list: pick up extra pasta-pots, maple syrup, and mustard for the black-eyed pea recipe on my way to my off-campus kitchen station, finish up any prep work, and start cooking! I’ve been stressed out for the last four hours because a helper has had to pull out, but at the last minute I recruit two of my do-or-die best friends to accompany me for my first hour in the kitchen. Luckily, one of them is both very kitchen-savvy and has arms that are ten times stronger than mine. I say luckily because when I get on site, I am immediately confronted by a huge plastic storage vat of soaking black-eyed peas, plus a silver catering tray full of them. Those 20 pounds of dried beans have fattened to a hefty 60 pounds, and I have no idea what to do with them. I’ve only eaten black-eyed peas twice in my life! In the kitchen I also find a neatly packed kit of aluminum pans for the cooked beans, canned organic tomatoes, garlic, olive oil, salt, and 10 pounds of carrots each the size of a sweet potato. Fortunately, in the fridge are 10 pounds of onions that have already been diced thanks to the work of other interns. I devise a game plan: one of my friends helps me peel the carrots while the other chops them into a medium dice. I mince the garlic. Then I arrange four pasta pots on the stove, drizzle olive oil into each, and start caramelizing the onions and carrots. The tub of soaking beans is too heavy to lift, so we make do with a tricky combination of straining the beans with a colander while using cups to empty out the liquid from the tub. Into each pot goes half a can of organic tomatoes, a teaspoon of salt, around two tablespoons of mustard, two tablespoons of maple syrup, some cayenne pepper for kick, as many beans as will fit, and water to cover. Sadly, my friends had to leave, but a couple more came along just as the first batch of beans were finishing up. I wanted to save the extra liquid from each pot in order to serve as a stock for the next batch of beans, so together we strained each pot of beans into a colander sitting in an aluminum pan, put the beans in one of the final serving pans, and dumped the liquid back into the pot along with all the ingredients for a new batch. We repeated this ten times – all in all it only took about five hours to cook it all! And I have to say, the black-eyed peas were amazing.